Nationwide school districts have found a growing need to remove several barriers to learning for K-12 students, and Scholastic is teaming up with the National Dropout Prevention Center in an attempt to achieve just that. The Scholastic Publishing Company was founded in 1920 by Maurice Robinson, in Pittsburgh, Pennsylvania. Initially publishing youth magazines, the company produced its first book - Saplings, a collection of student writings - in 1926. In 1997, Scholastic gained the rights to publish the Harry Potter series of fantasy novels, and, during the 2000 presidential election, established the Scholastic News Kids Press Corps, which includes more than 30 national and International reporters aged between ten and 14. Today, Scholastic is the world's largest publisher of educational books and employs over 6,000 people. The company has revenues of $344.7 million and holds the #266 spot on the Forbes list of America's Best Employers. The National Dropout Prevention Center was established in 1986 with the goal of reducing school dropout rates across the United States. The organization provides advice and solutions for educational institutions which are struggling with student retention. This advice is supported by active research, evaluation projects, professional development activities, and conferences. Based at the College of Education at Clemson University in South Carolina, the National Dropout Prevention Center has become the country's leading resource for engaging students and reducing dropout. In November 2017, the National Dropout Prevention Center announced a partnership with Scholastic through which the two organizations will combine efforts to raise nationwide awareness of the socio-economic, socio-emotional, behavioral, family engagement, school environment, and health and safety-based challenges which can all provide a barrier to student retention and success among the K-12 student demographic. 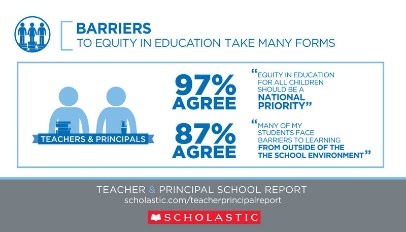 With 87% of educators agreeing that K-12 students encounter barriers to learning which originate from outside of the learning environment, it's crucial that challenges on all fronts are properly addressed to give the nation's children the best chance of achieving their true potential. "It is more important than ever that there is a concerted effort to ensure that young people fully develop the social, emotional, and academic skills needed to graduate and lead productive lives," said Dr Sandy Addis, Executive Director at the National Dropout Prevention Center. "Scholastic is an ideal partner to help us fulfil and expand our mission and we look forward to working together to reduce barriers to learning and reengage students in the learning process, cultivating the pathway for increased student success." This collaboration will take the form of Scholastic and the National Dropout Prevention Center working together to develop a new omnichannel suite of online and in-person resources designed to offer learning support - across multiple touchpoints - to educators, parents, and politicians, who all have a role to play in addressing the removal of educational barriers for K-12 students. "As an Innovation Partner, Scholastic will collaborate with the National Dropout Prevention Center to provide online and in-person opportunities for educators and district leaders to benefit from the resources available around learning supports from both organizations in the coming year," Scholastic writes in a blog post. "This targeted support will help identify and remove barriers to learning that affect student achievement while encouraging practices that support students' development." With many challenges evident in the support and retention of students, it is crucial that organizations such as Scholastic and the National Dropout Prevention Center work together to engage with all aspects of society to ensure that the nation's young people are properly equipped to enter the adult world with everything they need to succeed. The final word goes to Ron Mirr, Senior Vice President of Learning Support and Family and Community Engagement (FACE) at Scholastic Education. "Scholastic is working in schools every day and we are witnessing growing recognition of the importance of social emotional learning, the challenges presented by learning barriers from outside the classroom, and the imperative for learning supports. The National Dropout Prevention Center is a respected leader in this movement to better support students and we are honored to partner with them so that all learners have the opportunity to succeed, regardless of the challenges around them." You can hear Scholastic's Chief eCommerce and Digital Officer for the Scholastic Reading Club, Ghalia Bhatty, speak at eTail East 2018 this August at The Sheraton, Boston, MA.